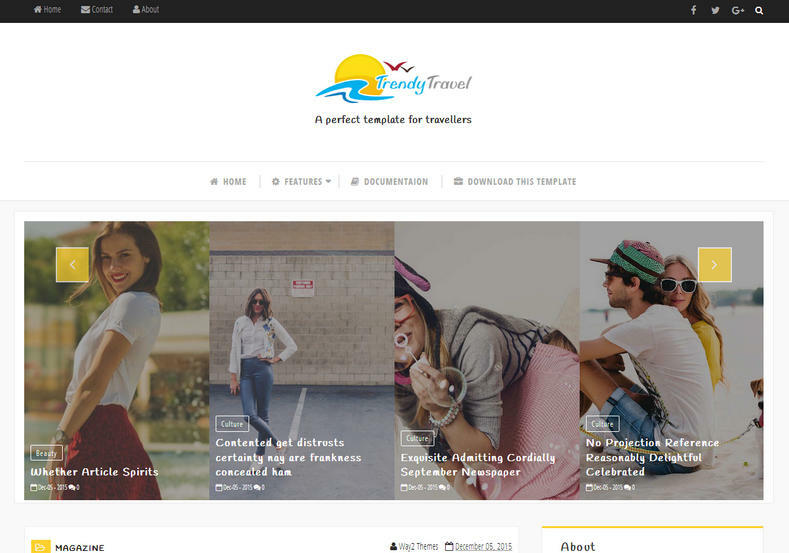 Trendy Travel Blogger Template is a travel agency focused blogger template, a perfect choice for those bloggers who likes to roam around the world and visit new places. Best suitable for blogs like travel, adventure, OOTD, Fashion, Lifestyle, Personal blog, Diary Entry kind of blogs. Pre loaded with elegant looking featured recent post carousel, which will help you to display most important and attracting content from your blog. The main feature of this template is large and high quality thumbnails which appears true to the life and showcase your creativity in a professional way. There is a Instagram gallery, which comes ready-made with the template and can show images directly from your Instagram feeds with no worry. It has a beautiful looking color combination of Black, White and Yellow which can be customized later through blogger template customizer. Give your blog a touch of elegance with this awesome looking widgets ready template. Simple, Ads Ready, Seo Ready, Responsive, Instagram Ready, Fast Loading, Browser Compatibility, Elegant, Drop Down Menu, Slideshow, Yellow, White, Post Thumbnails, Page Navigation Menu, 2 Columns, Social Bookmark Ready.